Thanksgiving is truly a family holiday. This is the holiday that celebrates those you love- the people you are especially thankful for. It is definitely one of my very favorite holidays! Not only is the food spectacular but it is often the one day that we get to see and catch up with our extended family. As the years have gone by, it has become more and more important to me to capture these family connections. I hope that you will also take advantage of this opportunity to create long lasting memories - memories for future generations. To help ensure that you will not miss the perfect shot, I have a few tips for you. This is essential to capturing your family on a busy holiday. Make sure that your batteries are charged. In fact, you should have a back up battery ready to go - just in case. Also, have your memory card loaded and formatted. (I reformat my cards before every shoot!) Back up cards are a must since Thanksgiving can be a full day event and you don't want to miss the shot of little Johnny exhausted at the end of the day and sleeping on Grandpa's lap. Now for the most important tip: keep your camera out and on a table where you can grab it on an impulse. Many shots are missed because we are looking for the camera. Keep it close by so you can grab it when the urge strikes. I plan to have my camera in the kitchen - where most of the action happens. Everyone relaxes and children play when you head outside. Plus you don't usually need a flash so you don't need to wait on a flash to charge before you can take your shot. If you are heading out on a post-meal walk, jog ahead of everyone and capture the family walking down the street or trail. Or hang back and capture them from behind. If you want to capture children playing, plant yourself in front of them and photograph the fun that ensues! I love photographing children when they forget that I am there. Below are shots of my granddaughter and her cousin - who she had just met for the first time - playing together. We were visiting family in Texas that we don't get to see very often. 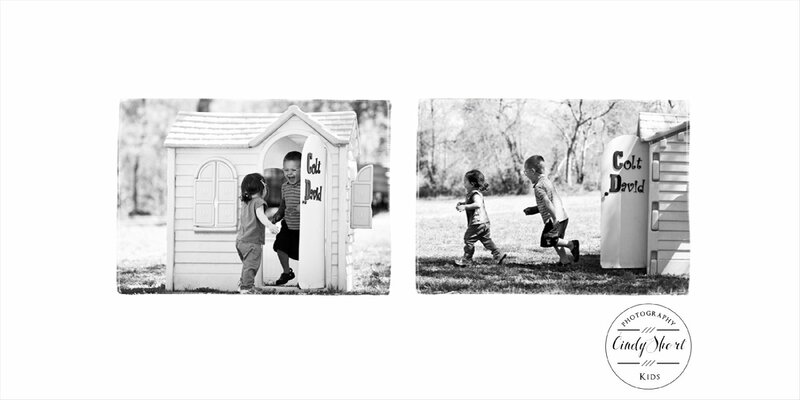 As these two grow up, these photographs will lead to great storytelling of the day they first played together. Holidays can be the only time several generations are together. Make sure you photograph Grandma and Grandpa with the grandchildren. Or a special Aunt or Uncle. During our trip to Texas, Cadence got to spend time with her Great Grandpa, whom she just adores. These images of them together will help Cadence share memories of Great Grandpa when she has her own children. 4. Photograph the local scenery! This is especially important if you are traveling. Try to capture family members with something that is unique to the area. While we were in Eastern Texas, the Blue Bonnets started blooming. So, I plunked Cadence down in a patch of Blue Bonnets and started snapping! You are creating family heirlooms! So, make sure they are still around for the future family members. Let's face it, your grandchildren are not going to be using iPads or CDs or memory sticks. Do any of you have images on floppy discs that you can't view? Technology is changing faster than ever but photo books and prints for your walls are now protected and laminated to last for generations. And we do still cherish things we can touch and hold. So, while your turkey and pumpkin pie is digesting, download those images, pick your favorites (the hardest part!) and get ready to make some prints or design a book. I recommend MPix.com for an easy, high quality online lab that offers a variety of product lines. Or if you prefer to use a local lab, try Digigraphics in Fort Collins. Both of these companies have excellent customer service and high quality printing. Happy Thanksgiving Everyone! I would love to see your favorite family photos from this holiday!